Coming to Berlin and bringing your kiddies? 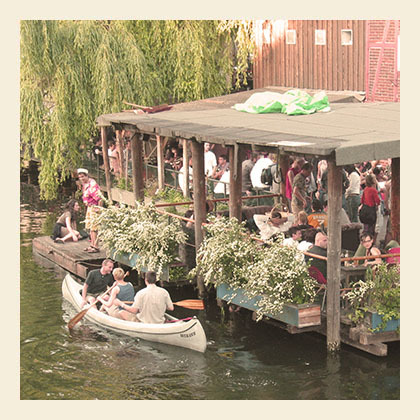 And you don´t know what to do beside the sightseeing in the historic heart of Berlin? We have listed up some nice parks, playgrounds and restaurants where you can easily bring your kids! Let the children play while you relax and chat with your friends and family. this is probably my favorite restaurant to visit with kids in summer. There is a big outdoor terrace with a playground in extension. While you sit and dine and talk and do more talking and when the kids get bored, they can go play. Where? At Senefelderstrasse 18. Not far from the EastSeven Berlin Hostel. at the end of the mauerpark, at the schwedter steg, there is a children´s farm called Moritzhof. there are all kinds of animals here, like ponies, pigs and bunnies. Also there´s a big playground right next to the farm. here you can eat simple but good food, your kids will love….Pizza, pasta, beef and potatoes…. After filling your bellies you can play Minigolf! And if the night is still young, you can drink a cold beer afterwards while watching the kids play on the playground….I can´t think of a more balanced evening, relaxing after a little bit of exercising and watching the sun go under…. Go there if you dare!! A bit spooky and scary, you may think, this park is located on the grounds of a former cemetery. It is called Leise-Park, which means as much as quiet park. You find here lots of nice playgrounds for your kids, also there are still some grave-stones maintained. It is a beautiful park, with many nice flowers and plants. Go there during the dawn and you might see a fox running through the park! Go here to get away from the busy center and to let your thoughts flow and your kids play. This is a good option for a rainy day! This huge museum will keep you and your kids busy the whole day, while exploring the 14 different exhibition departments, featuring locomotives, airplanes, ships, engines and much more. A lot of activities for kids to do and a lot of hands-on exploring to do! Getting There: Metro Stop “Gleisdreieck” (Line U1, U2), or “Möckernbrücke” (Line U1, U7) Easy to find, it has a real airplane sitting on top of the roof! For more tips and ideas on what to see and do in Berlin just read our hostel blog!